Thyme is native to the Mediterranean region and Asia Minor. Although more than a hundred different types of this herb have been identified, the two most popular varieties of common thyme are French thyme (or summer thyme) and English thyme (or winter thyme). While the former is more flavourful, it is the latter that is more prevalent in North America, as it is better suited to the cool climate. It is believed that the Romans introduced thyme in Europe. For a long time, it was mostly exploited for its fragrance: it was burned as incense in temples, during religious or magical rituals and people even used to embalm the dead with this herb. During the Middle Ages, it was used to mask the bad smells emanating from rotting meat. Thyme-flavoured honey has been around since ancient times and even today, it is much sought after by fine diners. Along with bay leaves and parsley, thyme is an essential component of the “bouquet garni”, a blend of aromatic herbs that is used in a variety of recipes. As the name suggests, the ingredients are bunched into a bouquet that is tied together with a butcher’s string. When tossed into the cooking pot, about 20 cm of the string should dangle outside the pot, so that the bouquet can be easily removed after cooking. The best way to preserve thyme is by drying it, as this enhances its flavour. It dries very fast when small bunches are hung out in the open air. 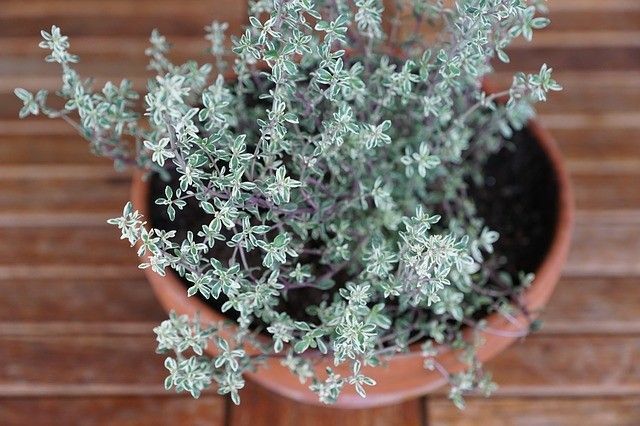 Once dried, thyme should be kept cool and dry in an airtight container. Originally published in the Journal de Montréal on June 12, 2010.